Windstream has been blazing a new path over the past few years, assembling a unique blend of ILEC, CLEC, fiber, and cloud assets to take on the enterprise market from a unique angle. With the addition of the PAETEC assets over the winter, they have become a major player in the fiber business. With us today to look at company's plans for all that fiber is Sean Baillie, Senior Vice President of the company. Sean came to Windstream from PAETEC and Intellifiber before that. TR: It has been five months now since PAETEC's fiber group became part of Windstream, unifying fiber assets from Intellifiber, McLeod, KDL, Norlight, and NuVox amongst others. How has the integration gone so far? SB: Lightning fast. Windstream is very adept at integrating companies, and it has been a very positive experience. The competitive markets are now all interconnected, which is a fairly easy thing to do. 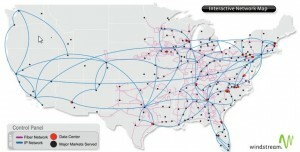 So we have a metro and long-haul fiber network spanning approximately 115,000 miles today. TR: Where are you focusing your efforts right now? SB: The company is taking advantage of both the revenue and cost reduction opportunities on the assets it has rolled up, and we are running down those paths very quickly. On the new construction side, there's a lot of focus on attaching more enterprise buildings and data centers to the network -- both Windstream's own data centers as well as those of independent operators. This is a massive network with available fiber, so we have the unique ability to delivery fiber-based services to customers across the country. TR: None of those predecessor fiber operators were heavily focused on fiber-to-the-enterprise, is Windstream aiming at new sales or at bringing existing enterprise customers on-net? SB: It's heavily weighted toward new revenue. We do come across buildings where we have a concentration of off-net expense, but that is opportunistic and not the driver. With a massive, very talented enterprise sales force, we think that the opportunity to add many more enterprise buildings and data centers to the network is absolutely right in front of us. TR: What types of opportunities are you acting on? SB: Generally what we're seeing in the SMB space is 50-200 Mbps with an Ethernet handoff and access to MPLS/SIP and Cloud services. For larger enterprises , we are seeing GigE and up as the standard with 10 Gig becoming more prevalent and 100Gig right around the corner, which we are prepared to deliver today.. We are working on every imaginable customer network design and deployment from simple single lateral builds with a Layer 2 100M pipe to multisite private networks with more bandwidth than some small cities need. There’s a marketwide desire for fiber-based services, and we are in great position to meet those needs. TR: Windstream's fiber is mostly in the eastern half of the country, any thoughts on a westward expansion – perhaps via M&A? SB: I can't comment on M&A, that's out of my jurisdiction. 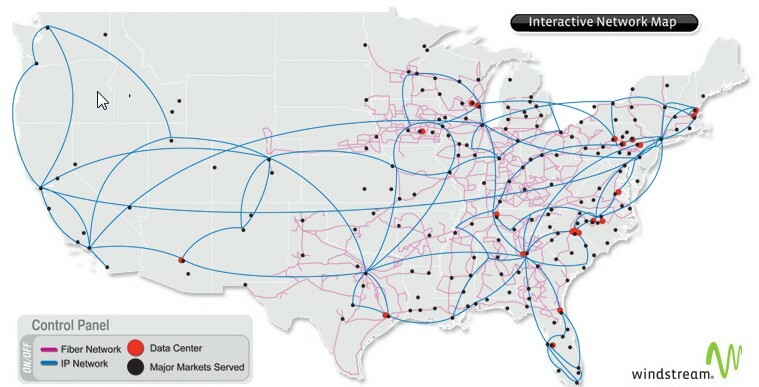 But we do already have some very interesting metro fiber assets out west with large on-net and near-net capabilities, such as Seattle, Salt Lake City, Phoenix, and Denver. We have looked at these markets in detail and will be investing where it makes sense. TR: Do you feel that the economics of the metro fiber business have shifted much in the last year or two? SB: It's much different. All I see is bandwidth demand per site going up, which by definition helps your economics. For example, today we’re selling 100Mbps circuits where a year or two ago that same customer needed 10-20Mbps. On the equipment side we are seeing excellent innovation to meet the increasing customer demand so the entire ecosystem is working well together. I think it's a very good time to accelerate the strategy of attaching more buildings because the tenants of those buildings need more and more bandwidth per connection. Windstream has a compelling suite of data and cloud products to offer once fiber is placed, which positively impacts the economics of a fiber build. TR: Have you had much luck with Fiber-to-the-Tower and wireless backhaul? SB: Windstream is participating heavily in that arena with very good success. There are builds going on daily to towers within both the ILEC or CLEC markets -- wherever we have available fibers and can generate good returns. TR: PAETEC also had a fixed wireless business, has Windstream found that useful thus far? SB: Yes, and actually we've been having tremendous success with that. So even where we don't have fiber, we can deliver big pipes via our national licensed fixed wireless spectrum. This is an excellent service for disaster recovery as it is completely diverse from fiber. I wonder if they plan on another purchase out west? Maybe a company like Integra Telecom would fit. Integra would fit the pattern, but they don’t seem to be in a hurry. this guy is so full of it! only if you knew!!!!!!!!!!!!! We want to know, so tell us.